The plain truth is traveling back to the US (especially from Asia) cost us about 3-4x the amount of money as it would traveling to neighboring countries. Basically what I’m saying is we can plan 4 vacations locally (on our continent or neighboring) and it’ll cost the same as going back home. Not that we don’t want to see our families…it just tends to be super expensive. Let’s not mention that wanderlust is often knocking at our door. We’re wanting to explore new lands! 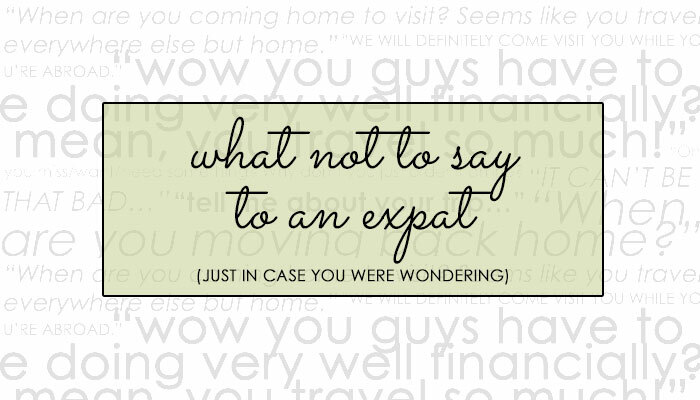 If you’re a relative or friend of an expat, don’t say this unless you REALLY mean it. Odds are we don’t have too many friends while living abroad, so we’re kind of counting on you to come and hang with us. We would LOVE company, and feel super disappointed when people don’t keep their promises. Remember the first point? About how it’s really expensive to travel home? Well when we travel locally (there’s that word again) it’s cheap as dirt. I’m talking 50-300 dollars a ticket! Not to mention food and lodging in Asia is also a good deal. $15 dollars a night for a bungalow in Bali (right on the beach)? $2.50 for an entire meal including appetizer, entree, and beer in Vietnam? Yeah guys, we’re not made of money. We just figured out how to travel cheaply. It’s feasible for anyone! When you live overseas it means you can’t just order anything online like you would back home. 80% of all websites that ship to the US and Canada don’t ship things internationally, and if they do, they also tack on a hefty shipping charge. Then we have to pay import tax on the items…it can be a real pain. Heck, if I could order enough starburst jellybeans to last me a year, I totally would! When we have something go wrong with our visa, living situation, or job, odds are it’s a lot worse than we’re telling you. When you live in a country as a legal alien, things tend to be a little more complicated than life at home. When you get into trouble you have to deal with things like: taxes, immigration (deportation), racism and prejudice, culture unawareness, and general misunderstandings. Odds are we don’t even know the whole story as to what’s going on. If we say we’re going to be kicked out of our apartment and will be homeless for two weeks, odds are we literally are. Don’t ever tell an expat it’s probably not as bad as it seems. It’s usually worse! This one’s really difficult to explain. I love that people ask us how our trips are and genuinely want to know. It’s just really, really hard to explain to someone all you’ve experienced and learned on your travels when they haven’t done so themselves. It’s super hard not coming off all pompous and show-offish, when all you want to be is humble and understanding. If I won the lottery, you better believe I’d be giving my family and friends first-class tickets to travel the world themselves. There’s something about it that you take from each place you visit that cannot be expressed or explained to those who haven’t been. The hard part is I know that loads of people wish they could travel, they’re just not in a situation that allows them to. I just generally hate this topic and try to skirt around it as much as possible. Probably never. Well, that’s what we say anyway. Truth is? A good majority of us expats don’t really know the answer to that question. There are people living abroad for a set time (due to a work contract or something) and know exactly when they’re going home. Then there’s people like Derik and I who have a general love for travel. Although we miss our families something awful, we have seemed to find our niche. We feel most comfortable being out of our comfort zone. We love life. We love adventure and exploration. Heck, if we could do this for a living, you better believe we definitely would! I wish I could give you an answer as to when we would move back to the US. 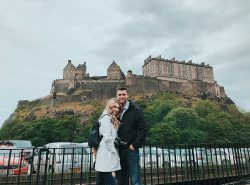 But as of right now, the expat life is ‘home’ to us! We don’t have any special opportunities awaiting us in the USA, and we’re taking advantage of the opportunities we have been receiving abroad. That being said, expats are just people too! Sure we may be a little less relatable than most, but we just want to be accepted, loved, and make our parents proud! Cheers to living life (and not making an expat uncomfortable).